Hello everyone! Julia from JCPL here and this go around in Dungeons and Dragons world we will discuss the first step in beginning any successful DnD campaign- creating your character. As with most things in DnD, you have near unlimited control over who your character is and who she/he will become. Which also means that you have to come up with the blueprint of who they are as well. We are talking about their race, class, abilities, proficiencies, physical description, socioeconomic status, backstory, personal ideals and all that jazz. Remember, DnD is a role playing game. You will be this character each session until the campaign ends or until the character dies, forcing you to create a new one, so have fun with it! Now you can create your character the old school way, pencil, paper, ample dice and research material (I.E.- Player’s handbook of the edition of your choice, Xanathar’s guide if you’re into it). Or you can use online resources like DnD Beyond. Pros for DnD beyond- you have all of your character’s information in one place and it does the heavy lifting for you in regards to figuring out your character’s equipment, proficiencies, and what their saving throws will be, and it helps to keep track of your items and abilities during the game. Cons- Not all of the options are free on the site, and you may have to pay to get some of the traits/ races/classes/ backgrounds that you want. Regardless of your method of compiling your personal character’s information the first step in any character building process is choosing your race. Now, races will vary depending on what edition you are using, and what your Dungeon master will allow. The following list holds most of the “standard” races. Remember, in creating your character there is no right or wrong answer, and each race has a list of pros and cons associated with it. I will give a brief description for each race in the list, but the Players Handbook will go into incredible detail on each of these races. Dragonborn– Humanoid dragon people, complete with scales and claws. Dragonborn are a physically strong race. Dragonborn get a breath attack associated with whatever dragon she/he is descended from. There is a long list, but just as an example your character could breath lightening at foes. Which is neat. You would also get a natural resistance to the type of damage your dragon ancestor wields. Dwarf- Think Gimli from Lord of the Rings- heartier but slower than some races. Most dwarves are between four and five feet tall. Dwarves naturally get resistance to poisons, and a boost to their constitution, but their walking speed is slower. They also get dark vision, which is something that you don’t know you need until you don’t have it. Gnome- Gnomes feel feelings with every ounce of their tiny bodies. Smaller than Dwarves, Gnomes are around three to four feet tall. They are cunning, so you get advantage on intelligence, charisma, and wisdom saving throws against magic. And bonus- Dark vision. Half-Elf- Half elves are cool characters to come up with backstories for, who were their parents? What kind of elven bloodline do you have? What society were you raised in? As far as stats are concerned, you automatically get proficiency in two skills of your choice, and your charisma score is increased by two, and two other abilities scores, of your choice, increase by one. Half-Orc- Half orcs are bulkier and slightly bigger than humans. If you choose this race, you get a bonus to your strength and to your constitution. You also get “endless endurance” where if you drop down to zero hit points during a battle (which means you pass out) you can use this to get you back to one health point. Though you do not have to be evil, half orcs do tend to have more aggressive, chaotic personalities. Halfling- Halflings are smaller humanoid creatures who are incredibly nimble and dexterous. They are similar to gnomes, though they tend to be less chaotic. Halflings get a “lucky” trait, where once per long rest you can re-roll a particularly unfortunate roll. You also get an advantage on saving throws against being frightened due to the race’s courageous nature. Tiefling- Tieflings are the descendants of demons and humans, and many of them have the horns and tail to prove it. Despite their heritage they are not innately evil, though they do tend to be more chaotic than other races. 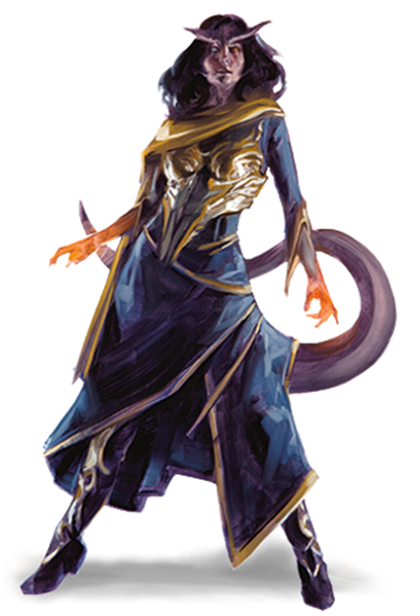 Tieflings automatically get dark vision, resistance to fire damage, and your intelligence and charisma automatically increase by one. Well kind reader, at this point in creating your character they really do seem confusing and hard to follow. But when you begin to play the game, and role play as this character, these are really important. For example- if you want a cheaper price on a health potion from a Gnome trader and so you try to haggle the price down. Your DM is going to ask you to make a persuasion check to see if the Gnome takes the lower price. For this you would do a straight role with a twenty-sided die called a D20 and add your charisma modifier. Say your character is a half-elf, you’re going to automatically get to add two points to that score, giving you a better chance of succeeding and paying that lower price. Don’t stress too much at this point about game play, right now it’s more important to ask yourself questions like: “Do I want my character to be very charismatic? Do I want her to be strong but surly? Do I want her to be very intelligent but incredibly awkward?” And just build her up from there. You may want to talk about the way certain races will be perceived in the world with your DM, Tieflings and Half-orcs tend to be frowned upon in some worlds because their ancestry is evil, they are also assumed to be. However the non-playable character’s opinions shouldn’t deter you, if anything you can build this into your character’s personality and history. Also, some other races are referred to as “homebrew” content, which means that the creators of DnD did not have a hand in making them, players came up with them on their own. Their statistics and proficiencies may not be clearly laid out like with the standard races, so if you want to be one of these guys make sure you involve your DM heavily in the creation of your character, and be prepared to have some of your stats “nerfed” or minimized. DM’s tend to do this if you’re creating a character that seems too overpowered or “OP”. Want more races? Check out Volo’s Guide to Monsters at your local library! While being a total god might sound awesome on your end, it is a logistical and narrative nightmare for the DM; remember this is a game where you play, win, or lose as a team. If you can’t get down with sharing the spotlight with your party members, maybe Dungeons and Dragons isn’t a great fit for you. Now that you (hopefully) have your race under your belt, next time we will get down to brass tacks about your character’s class.